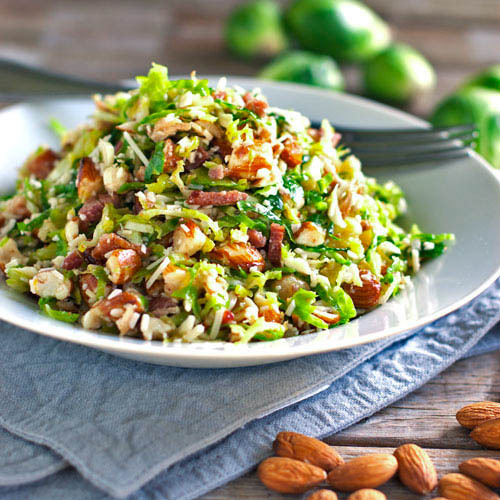 This bacon and brussel sprout salad is so good! Thinly sliced brussel sprouts, crumbled bacon, Parmesan, almonds, and shallot citrus dressing. Squeeze the juice of the lemon and orange into a large bowl with the shallots. Pour the oil into the bowl in a steady stream, whisking to form an emulsion (it should appear more creamy and less transparent). Season generously with salt and pepper. Refrigerate until ready to use. Using a mandoline, shave the brussel sprouts (not including the stems) into thin slices to make a shredded/slaw texture. I rinsed and dried mine again after shaving them just to be sure they were totally clean. Place the almonds in a food processor and pulse until chopped coarsely. Add 3/4 of the almonds, cheese, and bacon to the shredded brussel sprouts; toss to combine. When ready to serve, toss with the dressing and sprinkle remaining almonds, cheese, and bacon over the top. If needed, add a few more tablespoons of olive oil and toss.